gentlytiptoe: Finish projects, tidy up - its spring-cleaning time at gentlys house!! Finish projects, tidy up - its spring-cleaning time at gentlys house!! Today I rediscovered another UFO (they lurk everywhere) and I do think I might try to return to this project and complete it. I am putting it here to encourage me to get on with it. There, now you have all seen it, its public, make me finish it this time please!! 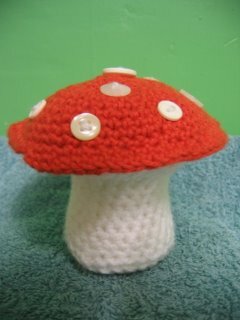 This is a crocheted mushroom that I made for my friend Weirdbunny who visited today. I really like it and will have to make another for myself, I particularly like the white button spots, a brainwave I had late last night as I was finishing the top. I am pretty new to crochet and struggle a bit with patterns, but I started out with a pattern I got from etsy which was really good and easy to understand. I soon deviated from the pattern though (I am not very good at being told what to do!) as I wanted the stalk to be longer. This was all several weeks ago, then I put the project down and promptly lost my pattern instructions, so when I picked it back up last night I just had to fudge my way through making up as I went along. It looks like I wanted it to look in my head, even if it is a long way from the original starting point, and quite a bit bigger (about 5-6 inches high I think).Weirdbunny had said she wanted one for ages so I am glad she likes it. And now changing the subject (almost) completely this is a picture of my new cabinet, part one of my 'New Plan For Tidiness'. 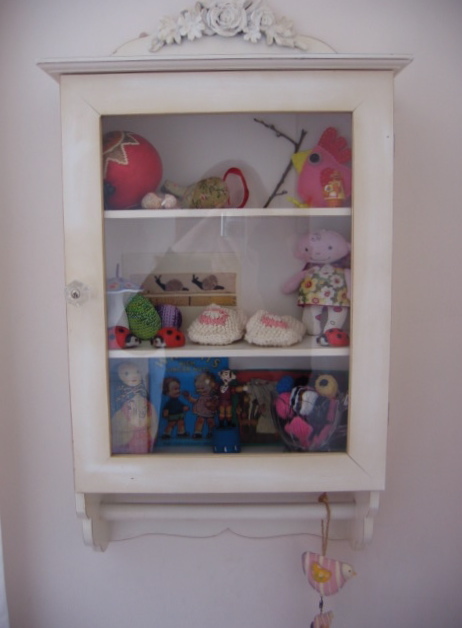 I am one of the messiest people you will ever come across -so here is the plan: Have little cabinets stuffed with, erm, stuff, up on the walls in each room, and then maybe that will satisfy the need to be surrounded by pretty things. Then I will be able to move some of the stuff off every other surface and the floor and maybe, just maybe we will be able to walk across a room without falling over or stepping on anything. I also want to put more things in it yet, this is just the start. 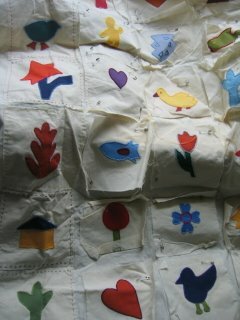 I love that unfinishes applique, how many years old is it now Hannah!! Finish it this month, I'll be keeping a check on you! Thanks again for my mushroom. Hannah, the quilt "guts" look great! I will be a cheerleader for you to finish it along with Weirdbunny :). The mushroom is cute too, the buttons are a nice touch. 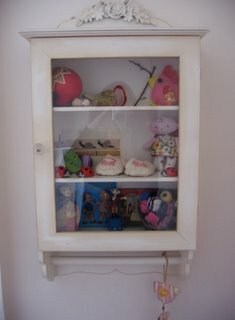 I love the cabinet (and the lovely things inside). Where did you get it from? wow, the applique project is amazing!!!! best wishes on finishing it all up!!! abandon all others until this is done - it is very beautilful - VERY! 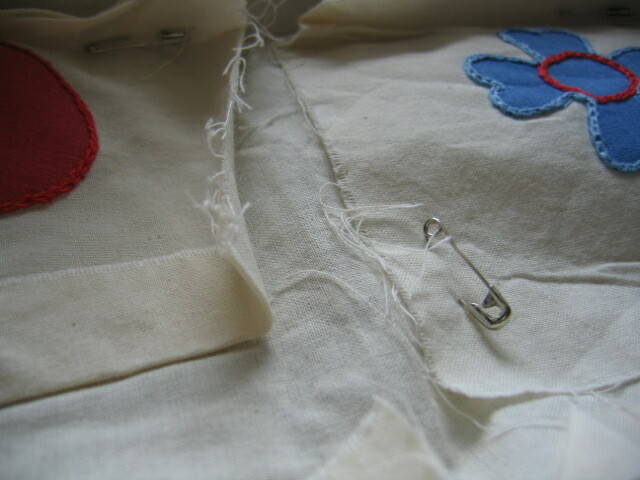 I love those little images - count up all your unfinished projects and lets have a competition - at last a competition I have a chance of winning!! !